Durability, safety and load-bearing capacity for adjustable roof top pipe support can be the key to preserving your commercial building roof investment. The Pipe Prop adjustable pipe support system has been rigorously tested with results between 1,745 lbs to over 8,000 lbs, which is extraordinary considering the product weighs a mere .05 pounds itself.Commercial building roof conditions bear the brunt of harsh weather, heat, water, cold and whatever form of HVAC drainage piping, electrical conduit piping or elevated plumbing piping used on roof top situations needs to have been tested to ensure a safer work environment as well as durability under the stress of weather and load capacity. So, how much load can an adjustable pipe support solution hold? This will depend on the conditions the pipe support is placed on and whether glue was used during the initial assembly as well as how high the supports are made. Higher supports tend to provide less strength overall as does supports that are not adhered to the roof. And as mentioned, the warmer the climate and hotter temperatures will deteriorate normal plastic products over time, reducing the overall strength and reliability of your pipe support. 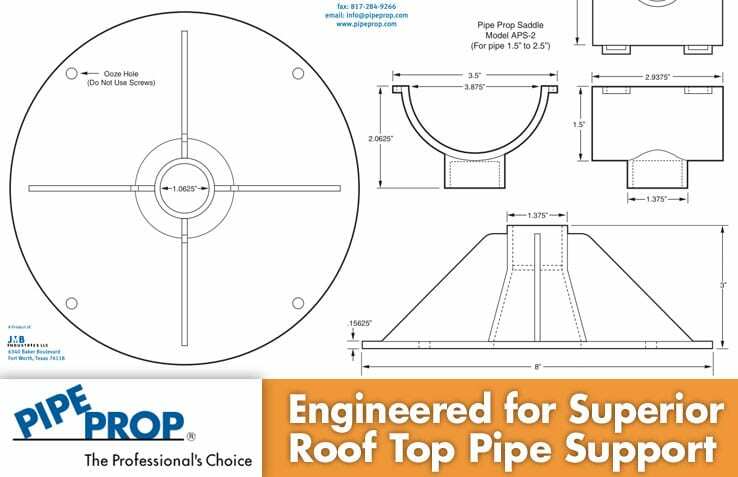 The Pipe Prop adjustable roof top pipe support system provides the perfect mix of flexibility, temperature and weight-tested materials and an easy-to-install system that is a perfect tool for air conditioning contractors, plumbers and electricians needing reliable roof top pipe support that lasts. Learn more about the Pipe Prop load factors and call us at 1-800-590-0120 or contact one of our manufacture representatives today.